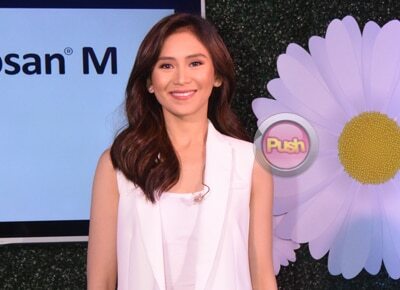 Why does Sarah Geronimo feel ‘parang nanalo ako sa lotto’? Sarah Geronimo couldn't be any happier that she was chosen as the coach of the first four-chair-turner in the latest season of The Voice Teens. Last weekend, John Mc Earl Estrada, 15, earned the approval of all four coaches with his performance of Iñigo Pascual's "Dahil Sa 'Yo." John Mc Earl chose the PopStar Princess as his coach. To this, Sarah, during her launch as the newest brand ambassador of Kamillosan M on Friday, revealed that she's still yet to get used to being chosen by the show's contenders. "Walang pa-humble effect pero every time may pumipili sa akin na maging coach, para kang nanalo sa lotto," she said. As the youngest coach, Sarah stressed "iba 'yung pinagkakatiwalaan ka." "Siyempre may Ms. Lea Salonga, may coach Bamboo at may Sharon Cuneta pa. Para piliin ka, ibang tiwala yung binigay sa ‘yo," she said. Sarah admitted that the said idea sometimes causes her to feel pressured. The Voice Teens ranked first last weekend, according to the data released by Kantar Media, with a whopping national TV rating of 37.9%. "Siyempre I am happy for the whole team and para sa mga teenagers kasi talagang iba din yung galing nila. Inabangan din ng mga tao," she said. The actress-performer said, "I'm excited na makita talaga more of them." But what's the difference of coaching teens and adults? "Ang teenagers ngayon, talagang they have a mind of their own, medyo opinionated at outspoken din," she explained. Sarah pointed out a crucial approach that the teens are looking for these days. "It's important that we show our respect din sa kanila. Pero as coaches, siyempre role namin is to guide them. Balanse lang kumabaga. Titimplahin natin yung mga bagets," she ended.